Although the 2008-2009 budget approved by the Oconee County Board of Commissioners included $33,500 for the salary of Keep Oconee County Beautiful Commission Executive Director John McNally, the county actually paid McNally $35,175. Oconee County Board of Commissioners Chairman Melvin Davis made the decision to give McNally the 5 percent salary increase, County Finance Director Jeff Benko told me on Dec. 11. Though not in the budget, the cost-of-living increase was consistent with the contract under which McNally was working. The amount of money spent by the county for McNally and the KOCBC became an issue last spring as the full commission discussed the 2009-2010 county bud get and asserted its right to determine how county money is spent. On June 23, the commission approved a budget of $19,100 for KOCBC for 2009-2010, including $12,000 for McNally. The budget total was $33,500 less than had been allocated a year earlier and did not include money for advertising, printing and binding, travel, dues and fees, and education and training, which had been included in the budget a year earlier. McNally, 84, a contract worker rather than regular employee, chose to remain in his position through the end of October, when he resigned. The KOCBC voted on Oct. 5 to elect Esther Porter to serve as its volunteer executive director to replace McNally. The controversy over funding for the KOCBC and its executive director was in the open and the most contentious part of the 2009-2010 budget discussions. What was not public, however, was the decision by Davis to increase McNally’s salary a year earlier, the growth in the budget of the KOCBC over time, or even the nature of the budget request for KOCBC for the 2009-2010 fiscal year. I filed an open records request on Aug. 23 asking for the annual budgets for the KOCBC and its forerunner, Oconee County Clean & Beautiful Commission, from 1999-2000 through 2009-2010. I also asked for the annual expenditures for the KOCBC and the Oconee County Clean & Beautiful Commission for the same time period. The open records request also asked for job descriptions and/or contract language covering the executive director and/or other employees of the two groups during this time period and "any documents related to agreements between Oconee County and Keep Oconee County Beautiful Commission/Oconee County Clean & Beautiful Commission...relating to office space and/or office services." Separately, I asked for the documents that Public Works Director Emil Beshara presented to the BOC meeting on April 15 in support of his budget request for KOCBC for fiscal year 2009-2010, as well as the document he used to support his request a year earlier. The KOCBC funding comes from the Public Works Department budget. These records show that Beshara, who at that time reported directly to Davis, prepared a budget request for KOCBC for 2009-2010 that did not include any money for McNally or the operation of his office. Beshara’s budget listed a total request for KOCBC of $9,600, which was for water and sewage, gasoline, supplies, and other general office expenses that any office in the county must include in its budget. He noted the change very quickly and without comment near the end of his 36-minute budget presentation to the BOC on April 15, saying the requested funds dropped from "fifty-three six to ninety-six hundred" because of the cut in technical services. The actual document released to me shows the 2008-2009 budget was $52,600, not $53,600. Beshara’s document also showed that McNally had received $40,310 in compensation for the 2008-2009 fiscal year that was not yet ended, rather than the budgeted $33,500. The final fiscal year figures, which Finance Director Benko produced for me on Aug. 25 in response to my open records request, show that McNally actually received $35,885 from the county in 2008-2009. Benko explained to me in an e-mail message on Tuesday of this that week that this $35,885 included $710 that was paid McNally to cover his expenses "for disposal of tires." Benko also explained that the $40,310 in "actual" expenditures for 2008-2009 for McNally that Public Works Director Beshara presented to the BOC in April "included encumbrances," that is, money committed but not yet paid. That document had been prepared for Beshara by Benko’s office. The budget documents Benko prepared in response to my open records request show that the amount of money the county has budgeted for McNally in the last eight years has increased dramatically. In 2001-2002, McNally was budgeted to receive $18,500, and that figure increased every year until 2008-2009, when the budgeted figure of $33,500 was the same as the year before. The decision by Davis to increase the compensation above the budgeted figure overruled that salary freeze. The total budget for the KOCBC grew from an approved $30,955 in 2001-2002 to $52,600 in 2008-2009, or 70 percent in seven years. Even with the increased spending for McNally’s salary for 2008-2009, however, the final KOCBC spending for 2008-2009 was $5,439 less than had been allocated in the budget. McNally spent only $7 of the $2,500 budgeted for travel, and only $522 of the $1,200 budgeted for education and training. Under Chairman Davis, the budgets for the KBOC were prepared by staff who reported to Davis, and the BOC reviewed and voted on the budgets. Last spring, the four other BOC members asserted their rights to be involved in the budgeting process, with Commission John Daniell being particularly outspoken in making that argument. The BOC put the new procedure in place for the future as part of the reorganization plan it adopted–over Davis’ objection--on Aug. 4. In response to my open records request, the county provided me with three contracts between the county and McNally. The first was signed on Oct. 1, 1991, and provided McNally $400 per month in salary. The second was for Nov. 7, 2005, and set the salary at $25,000. The third was for July 1, 2007, and set the "base" salary at $33,500 and stipulated that the "Board of Commissioners" would set the final figure "during the budget approval process." This final document stated that the agreement would be continued annually and that the level of compensation would be "contained in the annual budget as approved by the Board of Commissioners." It also specified that cost of living adjustments would be made to the salary. Former BOC Chairman Wendell Dawson had signed the first of these contracts, and current Chairman Davis signed the second two. When I met with Benko in his office on Dec. 11 to go over the Keep Oconee County Beautiful Commission budgets, he explained the discrepancy between the amount budgeted by the BOC for McNally’s salary last year and the amount he received by saying that Davis made the decision to give McNally the "cost of living" salary increase. The cost of living adjustment had not been applied to McNally by the Board of Commissioners when it approved the budget for 2008-2009. Davis and McNally live less than a mile apart in the southeastern part of the county. McNally’s address is 1510 Wildcat Ridge Road, while Davis lives at 1772 Oliver Bridge Road. According to county tax records, the 11-acre tract McNally owns has a small common border with the 11-acre tract owned by Davis and his wife. Porter, chosen subsequently to be executive director of KOCBC, and two other members of that group appeared at the meeting of the Board of Commissioners on June 23 asking that McNally’s salary be included in the budget. BOC Chairman Davis sided with the KOCBC at that meeting, pitting himself against the other four members. The full BOC restored the $12,000 part of the salary as a compromise. 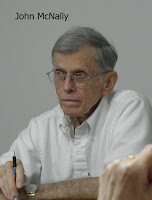 KOCBC and its predecessor have been active in the county for nearly 20 years, and its members argued during the controversy that McNally had been instrumental in many of its programs. The group has a wide range of activities scheduled for this fiscal year, including chipping of Christmas trees, old phone book collection, the Adopt-A-Mile program to encourage organizations to clean up litter, and the Great American Cleanup conducted in collaboration with National Keep America Beautiful, of which the KOCBC is an affiliate. Among its other activities are school education programs, cleanup of the banks of the Apalachee River, a compost bin sale, electronics recycling, and participation in a teacher reuse store. At the Oct. 5 meeting, Mary Mellein, chair of KOCBC, said the commission had thought it needed a full-time, paid executive director to meet the requirements to be an affiliate of Keep American Beautiful. The commission learned after McNally’s salary had been cut from the budget that a non-paid, volunteer executive director is sufficient, she said. Porter will use office space in the Utility Department previously set aside for McNally and coordinate her work with Amy Morrison, stormwater and environmental coordinator in the Public Works Department. Porter is one of 14 members of the Keep Oconee County Beautiful Commission and a local businesswoman. Members of KOCBC are appointed by the Board of Commissioners. On July 16, after the BOC had voted on the 2009-2010 budget and cut McNally’s salary, both Commission Chairman Davis and Commissioner Daniell met with the KOCBC. According to minutes of the meeting prepared by KOCBC member Marge McKee, Davis opened the meeting and led a discussion of the future of the group. McKee’s reported that Davis said the "BOC felt that the job (of executive director) could be done in-house and save the county $35,000." Daniell didn’t get much attention in McKee’s notes. "In retrospect, he (Daniell) agreed that communication regarding John McNally’s position was ‘terrible’," McKee reported.